John Bleach gives an overview into how the town and its surroundings have been depicted by artists from 1600 to 1950. John is approaching this potentially vast subject area from two angles: as an historian interested in the land-use and architecture of the town, and as a picture browser with a penchant for topographically-based watercolours and prints. Some of the artists represented are anonymous and unknown, some are named and little known, and one or two are just plain famous, but what they have in common is that they looked at a view or building and interpreted it with pencil, pen, brush and burin. 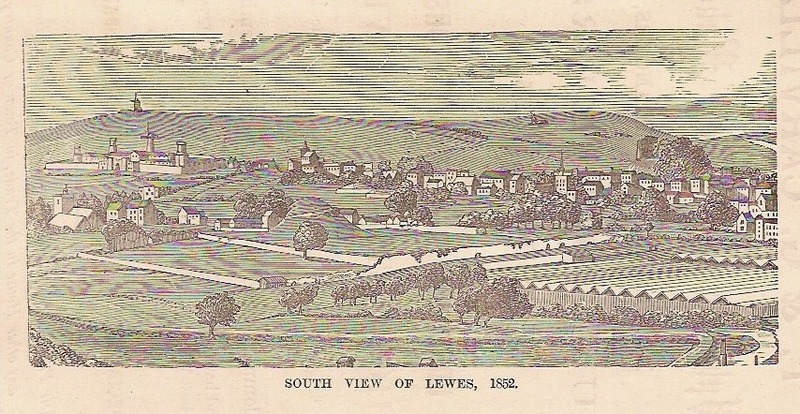 The print advertising John’s talk is taken from the Antiquarian and Visitors’ Guide to Lewes by William Banks, published in 1890. Dating from 1852, it offers an early view of the County Prison (built 1850-53), and a tantalising glimpse of the agricultural showground with its ‘long ranges of boothing for the different implements to be exhibited’ on the south side of the lower part of Mountfield Road. The ‘Royal’ show was held here in 1852. If you would like to bring along your own paintings and prints of Lewes to share with the audience attending the meeting, please bring them along at 7 p.m. If you let John Kay know at johnkay56 [at] gmail.com he will do his best to ensure that a suitable display place is available.